This is a film to please most fans of scary dramas related to ghosts and the mysteries of the Catholic Church. There are such strange and curious things happening in the Abbey of St. Carta in Romania that the Vatican sends Father Burke, an expert in exorcisms and miracles to investigate and restore its sanctity. He is to be accompanied by a young novice Irene (Farmiga) because she is one who has had visions that have given her experience in dealing with mysteries. Most significant at present is the recent suicide of a nun who hanged herself from a high window and landed on the entryway. A local delivery boy named “Frenchie” (Bloquet) discovered her body, and is aware of the fact that her blood that spilled never dries. He moved her body to the ice house with the thought that she would be better preserved there. To his surprise, when he takes Father Burke and Irene to see her she is sitting up; whereas he had last seen her lying down. This is the least of the weirdness the three will encounter during their visit; i.e., nuns, some hideously frightening and threatening, suddenly appearing or simply observed as shadows; Father Burke being confronted by a boy he previously exorcized but was injured in the process, then the Father being suddenly blown into a casket underneath the ground; and even the appearance of the incarnation of Valak (whom Burke describes as “the marquis of snakes”) in the form of an evil nun. The task that becomes clear for Father Burke and Irene, is to seal up the gateway to evil—the portal to Hell—but first, they have to find it. This will take many “prayers of perpetual adoration” for the nuns, and for Burke, exorcism and re-sanctification. The audience in the screening I attended clearly got into the drama with audible sighs, nervous giggles, gasps, and uh-oh’s. I was entertained for a time with the mystery, but as more events occurred that strained my reason, my attachment waned. 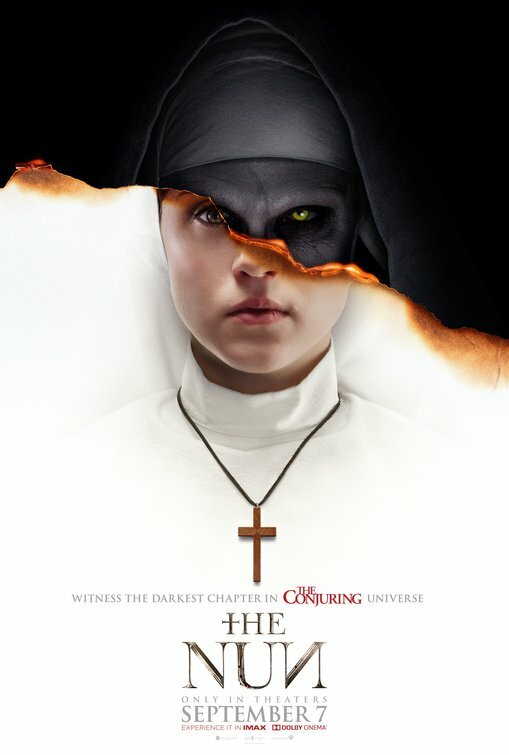 Apparently, The Nun is a prequel to the two Conjuring movies that have preceded it, and related to additional films: The Amityville Horror, Annabelle, and Annabelle:Creation—all having to do with attempts to neutralize paranormal events occurring in houses and, in the case of The Nun, in a convent. The shows have been mostly popular among horror fans, at least for those familiar with the Christian faith, particularly Catholicism. It seems like much of the thrust is lost among those who, like me, do not adhere to that set of values and are not well versed in the mythologies/stories associated with them. Additionally, one of the characteristics of this film and horror movies in general, is people tempting fate, so to speak; that is, going downstairs to a darkened cellar after hearing suspicious sounds. In The Nun, Father Burke and Irene repeatedly go off on their own during times of increased threat. Wouldn’t you think they would want to stick together? They were apart one whole night, during which time, the Father ends up in a casket and Irene is locked away in a far-off room. For horror fans—especially those loving the previous films—and not bothered by such things, The Nun could be an exciting thriller, with good acting and special effects. A thriller related to its predecessors—Conjuring, Annabelle, and similar films.